As part of Southbank Centre’s Being a Man festival, the Royal Festival Hall played temporary host to a series of ‘Men’s Sheds’ from across London, offering free workshops and skill demonstrations accessible to all. 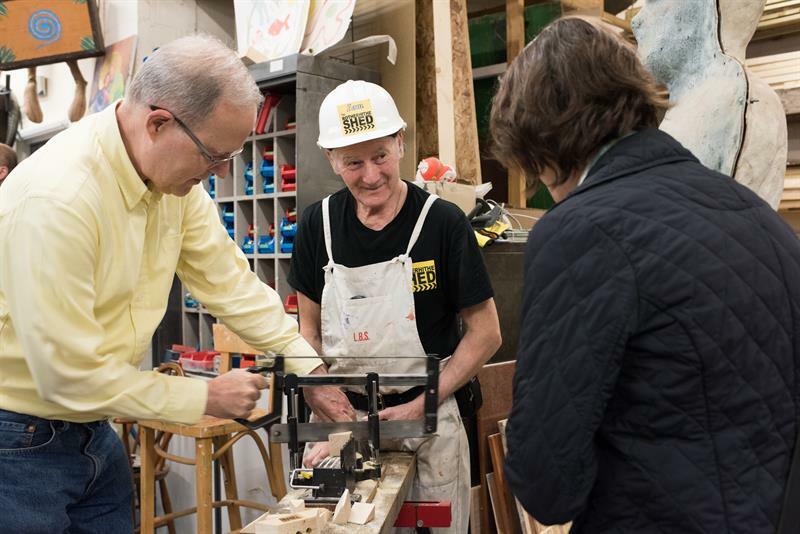 The Men’s Shed movement started in Australia as a fun and engaging way to combat social isolation and mental health issues experienced by older men. The movement has inspired several initiatives in the UK, including the brilliant Rotherhithe Shed – a partnership project between London Bubble Theatre Company and Time and Talents Community Centre. Launched in 2014, Rotherhithe Shed aims to bring together older men and women to put their practical skills to good use - fixing, making, whittling, drilling, sawing and generally tinkering. Sessions are held in a well-equipped workshop where participants can work together on a range of practical activities. Skilled artists and technical experts are available to support the participants, and project ideas are strongly encouraged and developed. Free, participative and open to all, the Shed is a great opportunity for anyone looking for social and creative experiences, including a chance to make new friends, to experience the camaraderie of working with others or simply putting practical skills to good use. In November, Rotherhithe Shed landed at the Being A Man (BAM) festival in the Southbank Centre. They shared their skills and invited the public to make a pencil holder, try their brand new suped-up pedal lathe, and contribute to their Nail-Portrait of Isambard Kingdom Brunel. They had special presentations by Peter Gazey from Pinholography, and Alan Chadborn from Sturmy-Archer uncovery, and the workshops were attended by an enthusiastic and diverse audience. It was great to see people of all ages getting stuck in, learning new skills and working together. London Bubble’s Creative Director Jonathan Petherbridge spoke passionately and inspiringly to the Flourishing Lives team about the importance of making creative spaces available to older people so that they can create their own opportunities and connect with each other. He emphasised the vitality and revolutionary power of co-productions: organisations collaborating on projects as an exchange of ideas, resources and expanding ambitions. Rotherhithe Shed is a shining example of partnership in action.